Oanda review - Scam? Mobile? Demo account? Read more. Oanda is an American forex and CFD broker based in New York City, although they offer trading services all over the world. For many years, Oanda has been one of the driving forces behind the industry, especially on the American market. Oanda is also fully regulated with licenses and authorizations from several of the world’s most respected regulatory organizations. In order to offer their services in the United States, Oanda offers two different selections of assets depending on where you live. For example, as an American trader, you can only trade forex, not CFDs. But if you live in Europe, you can also trade CFDs. Generally speaking, Oanda is a really good broker, and the following page has been dedicated to a detailed review of their services. 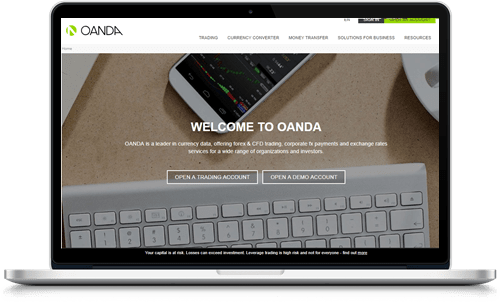 Oanda is a multi-purpose forex and CFD broker with an impressive international reach. In fact, unlike most brokers, Oanda is availabel in Canada and the United States, which makes them quite unique in the industry. Altough, it's not there international reach that's most impressive but their dedication to offer an innovative product to their customers. This dedication shines through in the industry leading platform and satisfying selection of assets. To us, Oanda is a great option for all traders, no matter where you live, how you like to trade, and what you expect from your broker. No, Oanda is not a scam but rather one of the most trustworthy forex brokers from the United States. We know this because Oanda has been around since 2001 and has served hundreds of thousands of happy customer during that time. The broker also has not one but several financial licenses from the world’s strictest jurisdictions. Oanda offers a few different platforms depending on what assets you’re looking to invest in as well as what device you prefer to trade with. The main platform is Oanda’s desktop platform that can be downloaded to any computer and can be used for both forex and CFDs. It comes with a large selection of useful tools, features, and charting opportunities, and can also be used as a limited web-based platform. In addition, Oanda also provides access to the Metatrader 4 for everyone that prefers to only trade forex. The MT4 is by far the best forex trading platform on the market. For all the traders that prefer using their smartphones and tablets to trade, there is an Oanda trading app. Oanda’s trading app can be downloaded to Android and iOS, and it’s very easy to use. The app is well-designed and the execution is phenomenal. The mobile trading app has a few really useful charting tools and trading signals which means that you can bring the app with you everywhere and you never have to miss a good opportunity again. Once again, you can choose to open several accounts based on your location. For example, there is a regular forex trading account, a forex and CFD trading account, a business account, and a really good demo account. The Oanda demo account is best for beginners that need to practice trading, but to some extent, it can also be used to plan strategies. As mentioned, Oanda’s selection of tradable assets differs depending on where you live. In the United States, one can only trade forex since CFD trading is banned in the country. Meanwhile, if you reside in Europe or elsewhere, you can also trade some commodities as CFDs. The same goes for margin and leverage which also differ in size depending on where you live due to different regulations. With that being said, Oanda’s selection of tradable assets is not very impressive, and pretty much every other broker provides more opportunities. In total, there are about 60-70 currency pairs available at any given moment, and these are available to everyone. Traders living outside of the United States can also buy CFDs on a range of commodities such as gold, soybeans, crude oil, etc. Additionally, one can buy CFDs on some of the world’s largest indices and a handful of bonds. If you’re into forex trading and commodities as CFDs, Oanda is a great option, but if you like to invest in stocks or cryptocurrencies you’ll have to look elsewhere. In order to cater to some of the world’s strictest jurisdictions, Oanda has acquired several trading licenses. United States: Oanda is operated under oversight from the Commodity Futures Trading Commission (CFTC) which is an independent part of the United States government. Canada: In Canada, Oanda is regulated and authorized by the Investment Industry Regulatory Organization of Canada (IIROC). Europe: In order to offer CFD and forex trading in Europe, Oanda has received a financial license from the Financial Conduct Authority (FCA) like many of our other recommended brokers. Australia: The only regulating body for trading firms in Australia is the Australian Securities and Investment Commission (ASIC) which is also one of the strictest in the world. Asia and Pacific: To reach the Asian market, Oanda has been licensed in Singapore by the Monetary Authority of Singapore. The running theme with Oanda is that your opportunities and possibilities differ depending on where you are, and the same goes for payment methods. With that being said, you can expect all of the common payment options to be available such as credit and debit cards, wire transfers, and online payment services. American traders can also use paper checks to fund their accounts. Like most top brokers in the industry, Oanda has an award-winning customer service that can help you with anything. The support team can be contacted via phone, email, and live chat and you can find all the necessary links and phone numbers on the Oanda website. In addition, there are several local operative offices that you can contact in San Francisco, New York, Toronto, London, Tokyo, Singapore, and Sydney. The beauty of Oanda’s website is that it updates and changes based on where you are so that local contact methods matching your location show. Oanda is an excellent and extremely trustworthy forex and CFD broker that has an incredible global reach. As one of the few brokers that focuses on the American market, Oanda has established themselves as a heavily regulated but flexible broker that constantly strives to be innovative. We really like Oanda and suggest that all of our readers check them out especially if you’re from the United States or Canada.